I am so excited that my Entropy Vest is published as part of Petite Purls Issue 14. I have always admired the patterns published in Petite Purls, so I am very happy to have a pattern of mine published by them. Entropy Vest is a take on the classic argyle vest. With its off-center argyle motifs, the vest tries to bring in a disorder in the otherwise ordered universe, hence the name Entropy. The vest is knit bottom-up in the round until the armholes, and the fronts and backs are worked flat separately. The argyle work is just 20 rows, so this is ideal for a beginner colorwork knitter. What a cute vest and congratulations on being published! 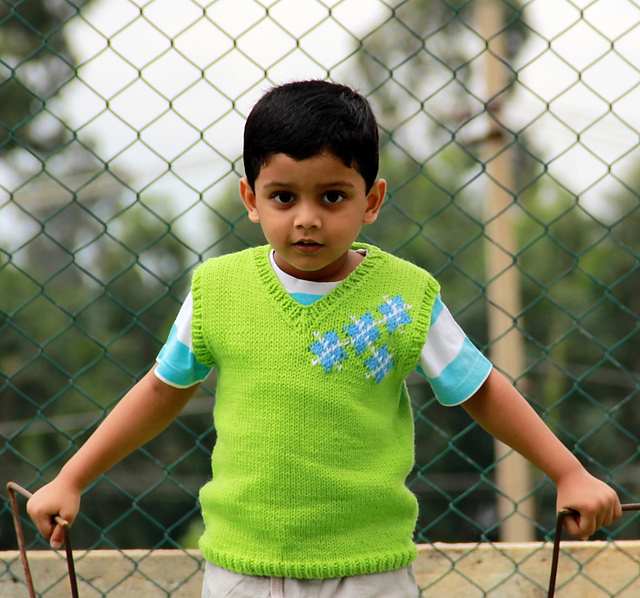 I love the off-center motif, it’s really playful and perfect for this little boy vest. Keep up the excellent work , I read few posts on this web site and I think that your web site is really interesting and holds bands of excellent info .